Photo by Franx', CC BY-NC 2.0 The ruins of Chichen Itza, a massive Pre-Columbian Mayan city in present-day Yucatán, Mexico is one of the most visited sites in the country. 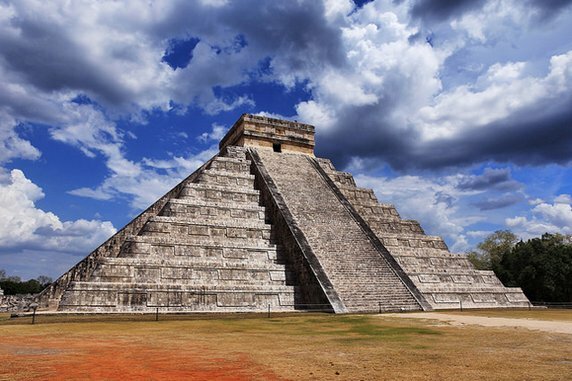 The central showpiece of this UNESCO World Heritage Site is El Castillo, or the Temple of Kukulcan. The large step pyramid was built between the ninth and 12th centuries CE and served as a temple to Kukulkan, a Mayan god. Despite its large intact stairs leading to the top, climbing El Castillo is prohibited. Photo by Mikaku, CC BY-NC-ND 2.0 This massive Buddhist temple in Central Java, Indonesia is a dome-topped pyramid that sits in the footsteps of two neighboring volcanoes. It consists of nine levels, more than 2,500 relief panels, 72 stupas and over 500 Buddha statues. A UNESCO World Heritage Site, Borobudur has undergone multiple restorations after neglect, volcanic eruptions and terrorism have, at different times, left the temple damaged. Photo by Never House, CC BY-NC-ND 2.0 Of all the world's pyramids, none are more famous than those in Giza, Egypt. Within the necropolis you'll find three pyramids and the nearby Sphinx among its other sites. The largest of the three pyramids also happens to be the last remaining Ancient Wonder of the World. The Great Pyramid of Khufu, or just the Great Pyramid, stands at nearly 480 feet tall and contains more than two million stone blocks. Photo by Valerian Guillot, CC BY 2.0 Like its neighbor to the north, you'll find Nubian pyramids in Sudan as well. In fact, in the ancient city of Meroe there are more than 200. While not as famous or as large as those found in Egypt, Sudan's pyramids are impressive in their own way, particularly for their abundance. These funerary monuments were built during the Kingdom of Kush between the eighth century BC and the fourth century AD. Photo by Jorge Dalmau, CC BY-NC 2.0 The Pyramid of the Sun in the ancient Mesoamerican metropolis of Teotihuacan is just 30 miles from Mexico City. The pyramid is located along the Avenue of the Dead and at just over 233 feet high, it's the largest in Teotihuacan and one of the largest in the world. There are numerous other temples and sites to see within the complex, but the Pyramid of the Sun is the showpiece. If you're up for a hike, you can climb the pyramid via the long stone stairs built into its side. For an easier option, take a hot air balloon ride for spectacular aerial views of the entire ancient city. Photo by Daniel Mennerich, CC BY-NC-ND 2.0 Deep within the Guatemalan rainforest you'll find the remains of Tikal, a Pre-Columbian Mayan city that is today preserved as Tikal National Park, a UNESCO World Heritage Site. Among the park's major structures are several pyramids that served as funerary temples, including the 154-foot tall Tikal Temple I (Temple of the Great Jaguar). Another must-see is the Lost World Pyramid within Mundo Perdido, an astronomical complex and one of the largest sites within Tikal. Photo by Joshua McFall, CC BY-NC-ND 2.0 This Neo-Sumarian step pyramid is considered one of the best preserved of its kind in Iraq and Iran. The Ziggurat of Ur was originally built during the Early Bronze Age in the ancient city of Ur. While largely reconstructed, the ziggurat still stands today in present day in Dhi Qar Province, Iraq. Civilizations throughout time have built pyramids across the globe. While they? have served different purposes, some are temples and others are tombs, the pyramids on this list have one thing in common?—?despite being built centuries ago, you can still visit them today. From the Great Pyramids of Egypt to Borobudur in Indonesia, these seven ancient wonders will impress not just ?because of their size, but also for how long they have prevailed against natural disasters, forces of nature, and political turmoil.